It’s understood the woman was asleep in the house when the fire broke out. 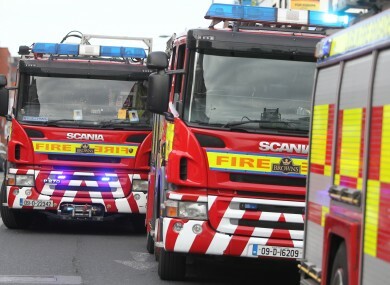 A 70-YEAR-OLD woman has been seriously injured in a house fire in Drogheda, County Louth. At approximately 1am, gardaí and emergency services were called to a house fire at Cord Road, Drogheda. When the alarm was raised a male aged in his 30s entered the house and managed to evacuate the woman to safety. The fire was brought under control and both the male and female were taken from the scene by Ambulance to Our Lady of Lourdes Hospital. The condition of the female is believed to be serious, while the injuries to the male are non life threatening. The scene of the incident is preserved for a forensic and technical examination and an incident room has been established at Drogheda Garda Station. Gardaí are appealing for witnesses, particularly anyone who was in the Cord Road, Oulster’s Lane, Sandyford Terrace, Thomas Street or Scarlet Street areas of Drogheda between 12.30am and 1am to contact them. Anyone with information is asked to contact Drogheda Garda Station 041-9874200 or the Garda Confidential Line 1800 666 111. Email “Woman in her 70s seriously injured in Drogheda house fire ”. Feedback on “Woman in her 70s seriously injured in Drogheda house fire ”.